A Web wayfarer named Bob Bardell dropped by yesterday and sent me a note pointing to EastBayHillPeople.com, a companion site to a guidebook describing evidence of Native American culture in the East Bay hills. Hikers in particular can soak this stuff up, because so much of it is in open country like parks and open space preserves. 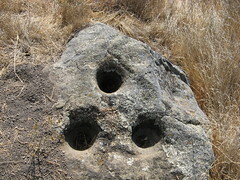 These holes (more properly called bedrock mortars, or BRMs) along the Horse Heaven Trail at Mission Peak, for instance, were ground by the native people eons ago. Another batch of similar BRMs lies just south of Alpine Pond at Skyline Ridge Open Space Preserve. 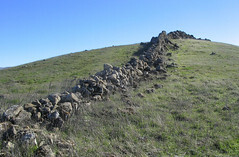 My friends and I, who are affiliated with eastbayhillpeople.com, have discovered over 110 Indian sites in the East Bay hills—most of them on public land. We try to get out 40-50 times a year, but we can’t get everywhere, so we love it when someone turns us on to a new site. The BRMs in question (there’s also a cupule/anvil on the side of the rock) are in an amazing location, not near any substantial water source. Even after years of exploring, I find new discoveries mind-blowing. Bay Area Indians were everywhere. The next time you get out to Morgan Territory you might want to visit the main Volvon village about half a mile from the main staging area just over the fence separating the territory from Los Vaqueros watershed. Take Volvon trail for about a quarter of a mile until you get to the gravel road that cuts through a meadow. There’s a sign that says “Los Vaqueros reservoir open/closed.” There’s a single track trail going past the sign. Take it. You’re already in the outskirts of the village but keep going until you get to the “jurisdictional fence” separating the territory from the watershed. Go through it and you’re there. There are 90+ BRMs on the little knoll by the fence and more than 350 on the shelf below. The whole village extends for half a mile and contains over 630 BRMs. There’s nothing like it this side of Chaw‘se. My article on the above mentioned web site “The Lost City in the East Bay Hills” describes the village in some detail and contains a map of bedrock mortar sites in what was once Volvon territory. The map is a bit out of date though. We’ve found more sites since it was published (including a site off Old Finley Road with over 100 BRMs) and more BRMs at sites we’d already cataloged. Aside from the rise of non-native plants, Volvon territory is little changed since the last Volvons were missionized or driven off their land 200 years ago. Thanks Bob, that one’s on our Go-To List. Come to think of it, those walls do look like they’ve been there for a very long time. If you’re curious, the Go Milpitas! site has a bunch of links about the native peoples of California.